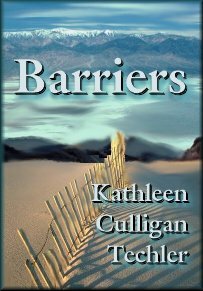 Any romantic will certainly enjoy Kathleen Culligan Techler's romance book BARRIERS. Marya Pierson is a physical therapist who lives on one of Florida's barrier islands. Marya and her sister, Penelope inherited their parents' condominium and Marya is set on honoring her father's final requests of making sure that Penelope's fiancé, Drew, isn't just out for her money, as well as searching for and destroying something mysterious that their father believed would ruin Penelope. Hard as it is for Marya, because she finds Drew annoying and extremely handsome, she intends to find out. This is somewhat an easy task for her as she sees Drew often when she makes home care visits to his Uncle Walter. Marya sees Drew more often than Penelope does because Penelope travels back and forth from New York to Florida during her busy days as a model.